Because you never know and definitely don't do a Google search for "Never Say Never" because that's a Justin Beiber song and now Google is going to think I'm a Belieber, and for the love of frickin' fat bassets, I don't need that haunting me like a bad Ambushed Paddington story. I didn't expect to go in that direction when I started this post. A Bieber reference and the first mention of an Ambushed Paddington in a long time. I used to have one of the top searches for Ambushed Paddington but now I'm on page 3. And for those of you unfamiliar with an Ambushed Paddington. Go do a Google search. Or you can visit one of my old posts. Take your time. I'll be waiting here. More importantly, are we still friends? I guess I should get on with my post instead of rambling on. A Donald Trump press conference? Thanks Mr. Koala for the rimshot. Going to work out at 6 a.m. I have never been a fan of the early morning workout. I am a huge fan of being asleep at 6 in the morning but it just works out best for our schedules right now. Sriracha sauce. I have been on a spicy kick lately and just loving this stuff. I'm sure doctors will come out in a few years and tell you that it will turn your pubic hair purple. But I look good in purple and the sriracha binge will continue. Having a different breed of dog other than a basset hound. I have had bassets all my life and still miss having one, but Ms. Frizzle has won me over. However, she just needs to quit eating our stuff. Below is a picture of what we used to call bicycle helmets. Now the kids have to ride around with pillows duck taped to their heads. Darn you, Frizzle. OK, so maybe the pillow helmet isn't the best idea. I went looking for new helmets and never thought I would get excited about buying the kids new ones. But I did. I found some awesome ones. 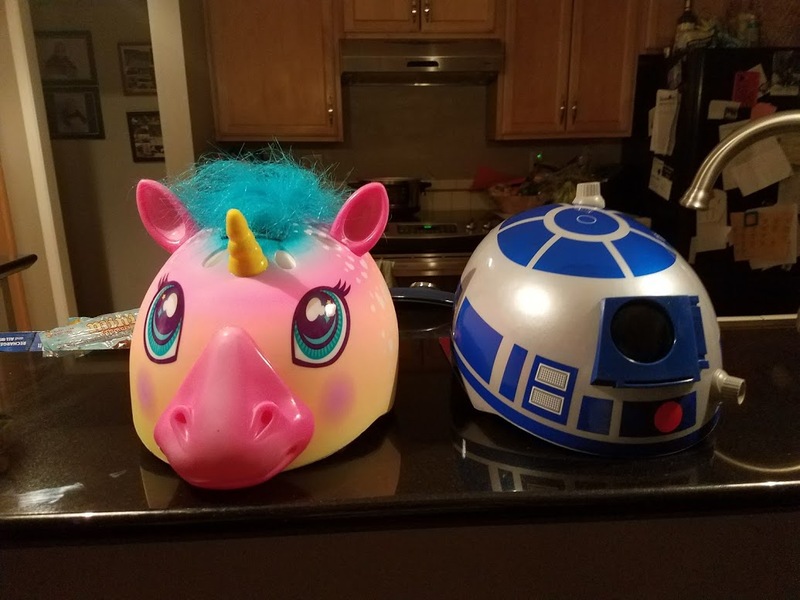 Kyle loves R2D2 and Hayden loves unicorns. Who has two thumbs and just won Dad of the year? This guy. Dying my pubic hair purple. I wasn't going to wait around for the sriracha sauce to kick in. I'm a mover and shaker. And full of it. Come on now, you know me better than that. I dyed them neon yellow. Cause, hello, that's a way better look for a middle-aged white guy. Well, that's all. Have a great week and thanks for stopping by. and praised her for her sock greeting. I like good old fashioned Tabasco. And salsa's? The hotter the better. I've heard that your tolerance of spicy foods goes down as you age. I sure hope not. Awesome helmets! I quite like the Sriracha sauce as well, and I am usually not a fan of the hot sauces of the world. And I have a feeling that my dog and your dog could play a rousing game of "Never Have I Ever..." on what they've eaten. i always had to hide me smile when old ruby chewed the wife's shoes. rubbing a little roast beef on the soles usually did the trick. have an excellent weekend mr shife. So, what;s wrong with 6 o'clock in the morning? I don't know those spicy items but I do like a bit of spice in my life.... the edible variety! Thing is, Matt, with labradors you can't leave ANYTHING lying around. They regard EVERYTHING as theirs, you see. But you've gotta love 'em! Purple pubic hair? It will take a while to get that out of my mind. Take care. Lovin' those helmets. I bet the kids loved them! Okay so is this the latest trend purple pubic hair? Ms Frizzle must have a stomach of cast iron. 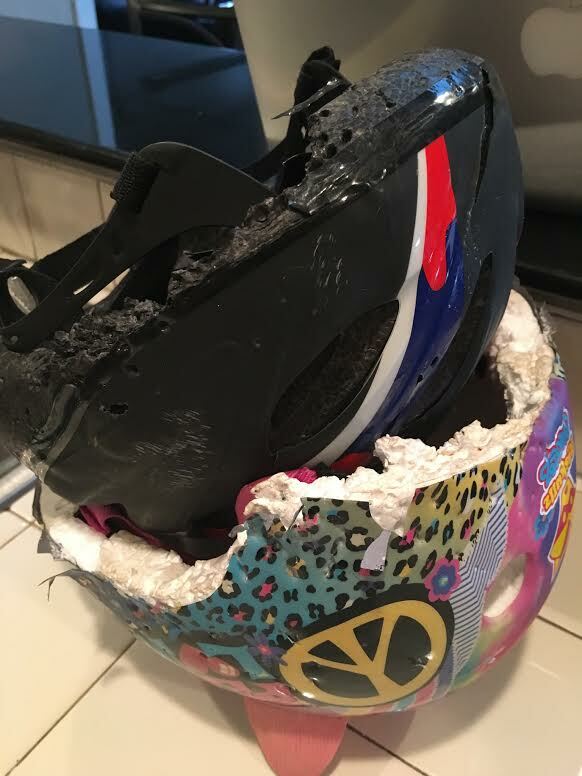 But the kids got great new helmets out of the deal. Hey, maybe they're in cahoots? I made the mistake of clicking on the AP thing; that was yesterday. Today I've forgotten what it was, but I DO remember that I thought I probably shouldn't have looked after all, so I'm NOT going to go click on it again to refresh my memory. Stop laughing and pointing at me, just wait until you're my age, young whippersnapper! !